Today, Monday, May 13, 2013, Swann Auction Galleries is hosting a spectacular graphic arts sale, an extravaganza of Modernist posters, 253 lots of some of the most visually arresting images you'll ever see. It's so impressive that Booktryst is devoting this week to highlights from the auction. "His name should have an important place in the history of posters because of his innovative aesthetics." So notes the Bénézit Dictionnaire des Peintres, Sculpteurs, Dessinateurs et Graveurs of Orsi, of whom little is known despite the fact that he designed as many as 1,000 posters. Bénézit praises Orsi's sense of simplification, his bright colors and his creative ideas. Philips Electronics was one of his primary clients. 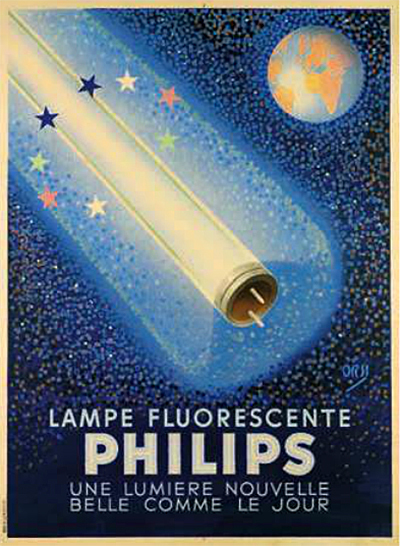 Here is Lampe Flourescente, printed by Bedos & Cie, Paris, c. 1940. As Nick Lowry, head of posters at Swann (and now its president), notes "the pointillist effect he creates to advertise a fluorescent light bulb is a classic example of the extent of his talent. The diagonal of the bulb itself, the unique handling of the coloring, the typography and the overall feeling of fluorescence make this an exceptional image." Charles Verschuuren Jr. (1899-1955) was an illustrator, cartoonist and part-time painter born in the Netherlands. 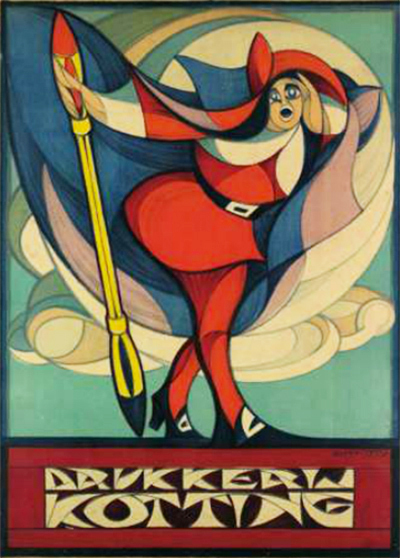 He designed over 100 posters before emigrating with his family to New York City in 1922. Once settled he contributed many illustrations to the Brooklyn Eagle Sunday Magazine. He also designed posters for the WPA and briefly worked for Disney. This poster, designed c. 1917, was for Drukkerij Kotting, the Amsterdam printer for whom Verschuuren did all of his design work before moving to the United States. 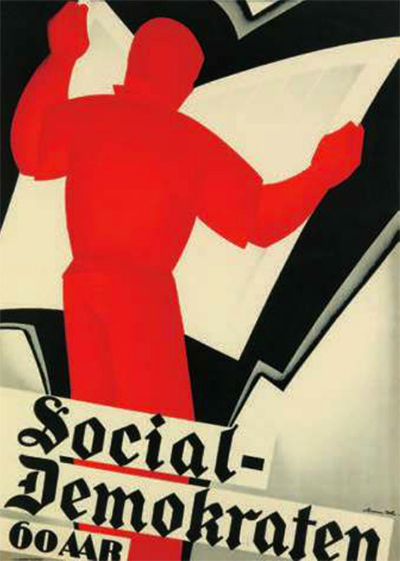 Sven Hendriksen (1890-1935) designed this poster, a bold image amplified by shadow effect, in 1934 for the moderate left-wing Danish Worker's Party, which published Social-Demokraten, a newspaper printed by Jensens Trykkerier of Copenhagen. Henriksen was a self-taught artist turned graphic designer who created this poster for the paper's 60th anniversary. I'm particularly attracted to the image because if its implicit subtext of reading as a political act. Otto Baumberger (1889-1961) was one of the most prolific Swiss poster designers, with well over two hundred designs to his credit. 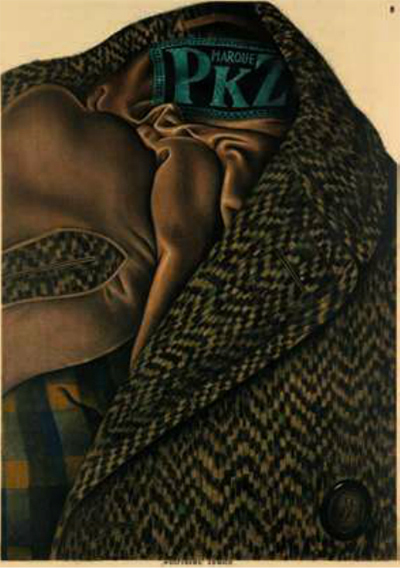 Beginning in 1917 he regularly worked for upscale Swiss clothing retailer PKZ. As Lowry notes, "this poster [created in 1923] is not only the best he produced for the company but is also an icon in poster history. The tweed coat is rendered in near-photographic perfection to the point where you can practically feel the fabric. Baumberger took a totally new approach to advertising by ingeniously incorporating the poster's text into the image in the form of the label in the coat. "With this poster Baumberger cemented his role as master of the 'Object Poster,' (a title he earned four years earlier with a classic image of a top hat), and began the trend of 'New Objectivity' within the Swiss school of Graphic Design. A sensation from the day it was issued, this image remains compelling and proves to be one of the finest of the PKZ posters." Pierre Segogne (?-1958) was a prolific poster designer for the cinema yet he and his work have been largely been forgotten and certainly under appreciated. But for a short period during the 1920s he was extremely inventive and developed a singular style using a stencil technique, applying colors using either a sponge or a roll. This gave his posters a singular appearance. 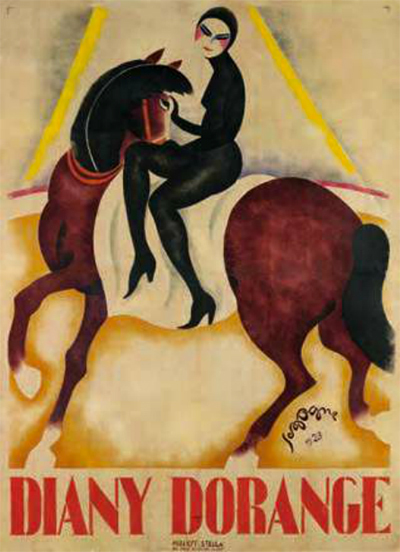 This poster was designed in 1923 for Diany Dorange, a circus performer with a popular equestrian act. A program from 1925 bills her as the star performer at l'Empire, one of the largest Parisian Music Halls. Gitty-up. This poster for Vitalis - Les Rayons Qui Guérissent was designed by Henry Farion (?-1991) c. 1935. Nikola Tesla and George Lakhovsky (who, as everyone knows, invented the MWO-multi wave oscillator; it wasn't, as I presumed, Moe Howard; thanks, Nick Lowry, for setting me straight) were celebrated in France; the use of electricity for curing all manner of physical woe was widespread. Electrotherapy kits for home use, such as those produced by Vitalis, were sold in sets that came in their own cases with separate attachments suited to treat different parts of the body. Such electrotherapy kits were prevalent in America until they were banned in the 1930s. 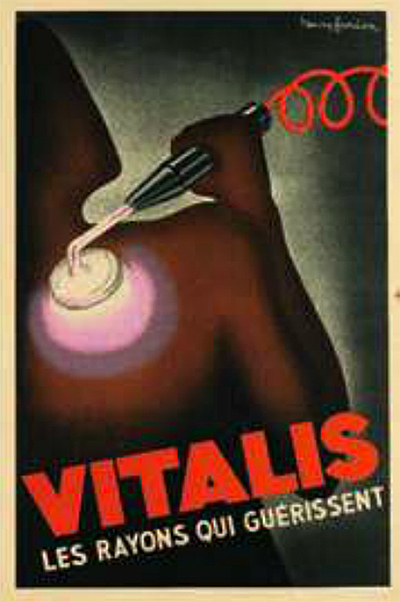 American men of a certain age will scratch their heads and let the dandruff fall where it may: in the U.S., Vitalis was a popular hair tonic offered in barbershops - along with Brylcreem, Wildroot Cream-Oil, Kreml, and Dapper Dan - as an alternative to "greasy kid-stuff," as its advertisements characterized the competition. With a couple of toes in the grave I confess to having used Vitalis and Brylcreem as a '50s kid in a desperate attempt to keep my curly hair straight and flat on my scalp and forestall its inevitable explosion into a Jew-'Fro for as long as possible. It's a little known fact that the trend for long, curly hair during the 1960s was established for my personal benefit, Harpo Marx my hairstyle model. Nicholas D. Lowry, the popular appraiser on Antiques Roadshow who enjoys "drinking scotch while listening to heavy metal music" (AR bio), appears to be a fan of Vitalis - the hair tonic not the electro-stimulator. 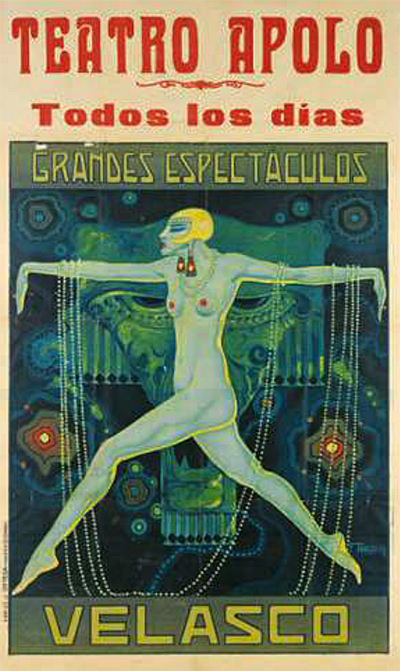 Just who F. Tarazona - the designer of the above celebration, c. 1925 ala Weimar, of 1920s music hall decadence and excess - was remains a mystery, as does the specific location in Spain of Teatro Apolo - Velasco. Be sure to stop by tomorrow when Booktryst continues its look at Modernist posters offered by Swann Auction Galleries. View the entire catalog in 3D here. All images courtesy of Swann Auction Galleries, with our thanks.